One of my fondest memories of my roommate’s late father was taking him to the ballpark on Thunder Over Louisville day here in Louisville, Kentucky. He had just been re-diagnosed and started treatment for his second round of prostate cancer. And he was having a good day. He ordered a foot-long brat and enjoyed that, then bought some German roasted nuts to share with us. Little did I know that Cuisine Cube was going to bring those memories back to me with the simple inclusion of one product in their March 2015 cube. Before I explain, let me begin by telling you a little bit about Cuisine Cube. Cuisine Cube has gone through some changes as of May. No longer do they strictly only offer gluten-free cubes. In addition to their gluten-free option, they now also offer Artisan and Vegan cubes as well. The Artisan cube means that you have no food allergies and foods that contain common food allergens will be included. The Vegan cubes contain products that are dairy and animal free. And, they still have the Gluten Free cubes, which will have products that contain no gluten or wheat. These box subscriptions start at $34.99/month. And, part of the charm is that you will receive 5-6 full-size (not sample size) products. WOOT! These usually fall into every meal category for the day: breakfast, lunch, dinner, snack and dessert…with an added bonus from time-to-time. So, if you’re really interested in being introduced to the smaller, lesser-known, artisan companies, give Cuisine Cube a try! I can’t wait to get back to receiving these in the mail. Tucked into my March Cube was the product that surprised me when I tried it last night as my dessert. Sometimes it takes me a little while to get around to products, but I always do it. They all serve a purpose. And, even though Cuisine Cube presented this product as the Snack portion of their cube, it can be so much more. 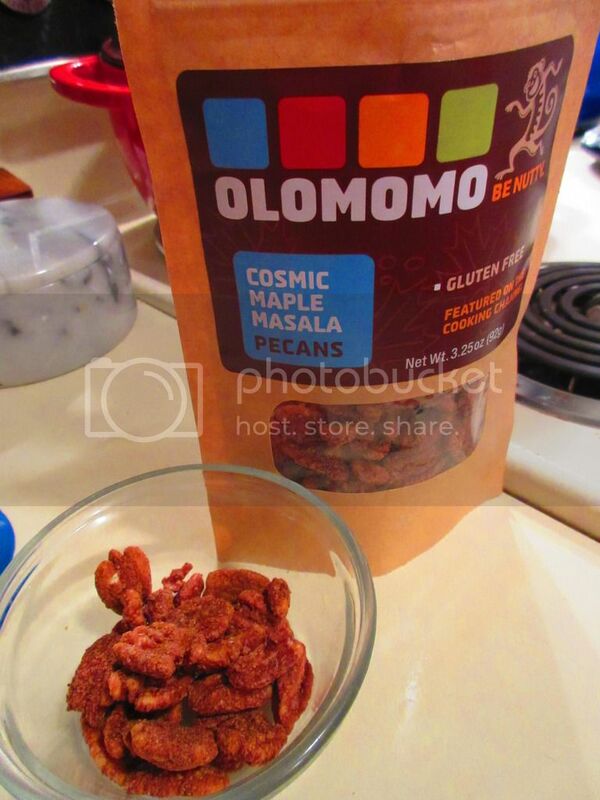 I’m talking about OLOMOMO Masala Maple Pecans. OLOMOMO Nut Company launched in one of my favorite places on Earth – Boulder, Colorado, in 2008 with one simple mission plan: be The Good Nuts and create one of the first socially and environmentally conscious nut companies. Their beginnings were humble, selling samples at the Colorado farmers markets, and then, eventually hitting the big time with a national debut on the Cooking Channel. OLOMOMO is quickly becoming a national brand. Currently, the product is available through natural grocery stores like Whole Foods and in coffee shops and smoothie shops (like Smoothie King) across the country. OLOMOMO is committed to developing fun, healthy products that infuse exotic flavors with familiar flavors, enticing your taste buds more than you thought possible. They use simple, real, natural ingredients, including fair trade, organic and sustainable packaging when possible. OLOMOMO is also the first US nut snack company to become certified as a B Corp for their socially and environmentally sustainable business practices. What’s not to love? Even more, what’s not to love about a company that strives to inspire people to be more nutty, good and adventurous. Now you’re speaking my language! These are great by the handful, but would really spice up a salad or some fresh yogurt as well. Go nutty! Be adventurous. That’s the entire point. Let’s discuss ingredients, shall we? OLOMOMO Masala Maple Pecans are made with pecans, organic evaporated cane juice, fair trade organic maple syrup, garam masala, and love. YES…my second product in a week that includes LOVE as an ingredient. It has to be good!! Food made with love is honestly really amazing food. Even more enticing is the nutrition information of OLOMOMO Masala Maple Pecans. This snack is a nutrition powerhouse. A serving size is 1/4 cup (30 grams) and there are about 3 servings per package. This one serving will provide you with 190 calories and 18 grams of (healthy) fat. You will be devouring 120 mg sodium, 9 grams carbohydrates, 2 grams dietary fiber, 6 grams sugars, and 2 grams of protein. These nuts are all natural, gluten free, and cholesterol free. Trust me…this little snack is so addicting. If you aren’t like me and dish out a serving, you could easily eat the entire package. I probably have seen OLOMOMO nuts at my Whole Foods and just never given them a second glance. Or, perhaps my area doesn’t carry them. But now that I know they exist, I’ll be searching for them for sure. Without this introduction by Cuisine Cube, I’d be a little less nutty today. Spice up your nut habit…try OLOMOMO! This entry was posted in Clean Eating, Cuisine Cube, Dessert, Food, Gluten-Free, Indian, Nuts, Products, Review, Salad, Snacks, Sweet Stuff, Vegan, Vegetarian, Yogurt by The Celiathlete. Bookmark the permalink.